Having a good backup mechanism is an integral part of maintaining not only a smartphone, but in fact any digital device. Settings and data can easily be lost due to numerous eventualities, and when such situations occur, those bereft of a decent backup system are quickly left exposed – losing some, most, or all of their important, irreplaceable data. Dropbox, and other cloud-based services provide an easy way to remotely store and backup files, keeping them in a safe place for access at a later date. DataSync by Quint Stoffers is the perfect Dropbox-based Android app for those not inclined to gamble on their device getting damaged, lost or stolen, and waving goodbye to those all-important files. Of course, you can store locally as opposed to via Dropbox or FTP if you prefer. 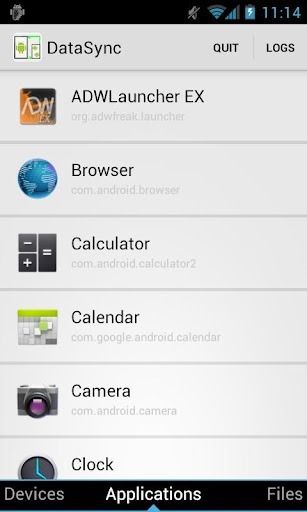 First and foremost, you will need a rooted device in order to synchronize backed-up apps. If you’re unsure about rooting, or cannot think of a good reason to root your Android device, you may want to check out this post, which explains in grave detail the many benefits brought about by rooting your device. As well as a being rooted, you will also need to have BusyBox installed – a link to which can be found at the bottom of this post. The first think you’ll notice about DataSync is its beautiful user interface. I tend to place functionality over looks, but it boasts an eye-catching Ice Cream Sandwich and tablet compatible UI which any app-dev would be proud of. It offers swift, multithreaded and parallel syncing, with optional Dropbox and FTP up and download capabilities. 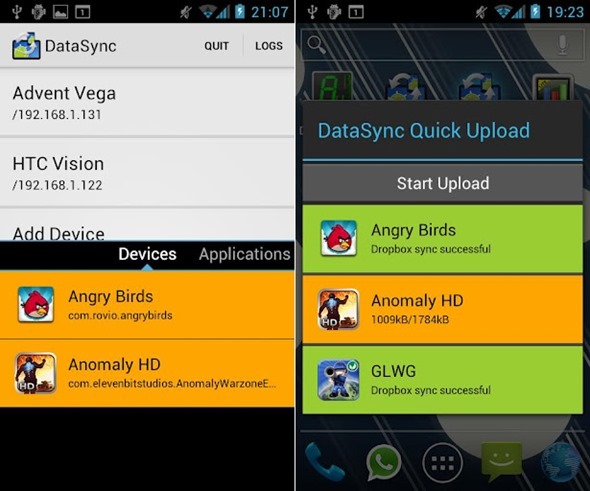 Interestingly, DataSync also allows the inter-device sharing of application data. So if, for example, you’re playing a game on your smartphone, you can easily sync with DataSync and continue playing on your tablet, picking up from where you left off. Much work is currently being put into updating and improving DataSync, which is always a great sign. The devs are working on tutorial/help dialogs, and plan to implement uploading and downloading scheduling for automatic synchronization as set by the user.